There are two kinds of intelligence. from books and teachers, new ideas and memorization. but retaining all that knowledge is a burden. is the one who has gone beyond all this. its fountain is deep within the soul. it never stagnates or becomes impure. And if its way to the outside is blocked, what harm is there? For it flows continually from the house of the heart. if those pipes become blocked, the house is bereft of water. Seek the fountain within yourself. Architectural Neglect – Lahore again..
Random musings in continuation of the discussions on the construction of the 7 (or is it 5?) -star hotel in Islamabad on Adil Najam’s blog, All Things Pakistan…. The inspiration for this post comes from an image of the Lahore Railway Station sent to me by my J. Brommel. Once a regal specimen of the Raj architecture and a landmark of Lahore it is losing its grandeur. The sad part is that these are not-so-old Raj structures. Forget the Mughals and the eras before. 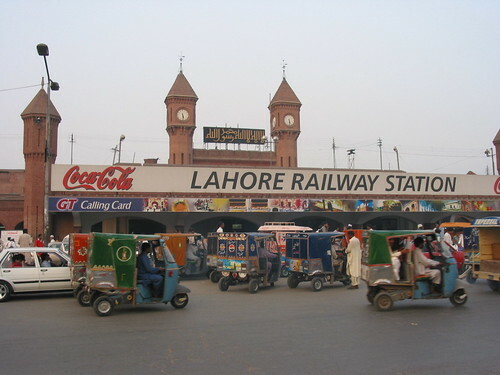 What has happened to the Lahore Railway Station is a metaphor for transnational control and the rise of marketing gods. The photos below from Harappa.com show the Lahore’s majestic Station in 1895 and 1995. As the top image shows that in a little over ten years, it looks so different. Unregulated commercialization! I am not against modernity nor naive enough to ignore the fact that population pressures and globalization are pressing issues. However, losing the character of our cities and historical landmarks is just depressing. Driving through Defence [Lahore], you cannot ignore that it is not only trees – like Jacaranda and Bottle Brush – that are imported, but even the architecture of houses that reflects an ‘imported’ look. You see all these residences with tiled, sloping roofs and huge glass windows, both of which are completely inappropriate in a place where it does not snow, and the sun is so harsh, that the extensive use of glass traps hot air in the buildings, necessitating the use of air-conditioners. Can’t help wondering where we see ourselves headed. I realise that both our urgency to urbanise and our reluctance to grow local trees, have the same root cause. The value of the design of our house, office, neighbourhood and city, as well as the … What does matter, is that this design and this plant should look ‘imported.’ The further away it comes from, the more we esteem it. The only reason that comes to mind is that we must be ashamed of ourselves. We have internalised a cultural inferiority that embarrasses us of any association that reminds us of our roots, of our own indigenous selves…. Using the lens of the ‘foreigner,’ we see ourselves categorised as ‘crude,’ ‘boorish,’ ‘uncultured’ and ‘uncivilised.’ We then make every effort to prove our distance from all those practices that typify these traits. And what happens when we follow this route? I guess we really become ridiculous caricatures of what we are not. And now the emerging elites (read estate dons, powerful brokers, commodities’ dealers and other groups that wield enormous power in Pakistan) want to replicate a hideous version of the Burj in Islamabad in the form of The Centaurus–the hotel with the indeterminate number of stars!. Good luck to them and good-bye to our centuries’ old traditions of art, architecture and public aesthetics. 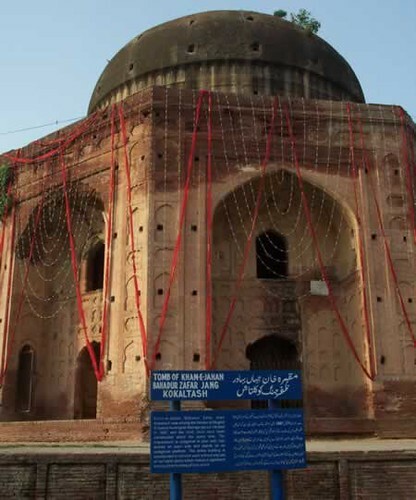 The tomb of Bahadur Zafar Jang on the canal is decorated for a wedding, in violation of all conservation laws. What else is there left to say. Click here to read the discussions on this post.